Petitions are making the rounds and a protest is being organised, following the news that Knowsley Council will be selling 17 of its parks for development. A list of parks set to be handed over during the course of the next 15 years includes Broad Lane Playing Fields, Roby and King George Playing Fields. The council insists that the move will protect the remainder of its green spaces from government funding cuts, with £40m from the sale being invested in a charitable trust for the upkeep of the rest of the borough’s 144 parks. However, some locals are deeply happy at the idea of losing their parks, and an online petition has been started, with members of Prescot’s Green Party also collecting signatures. A protest has been arranged by the Green Party, with members of the public urged to stand alongside them outside Huyton Council Offices on December 13th at 3:30pm. They say the demonstration will be peaceful, “but bring your whistle”. Knowsley resident, Abbie Eves, told JMU Journalism: “I have used this park for over 14 years. I started coming here with my dad before I can even remember. I’ve made endless memories here. 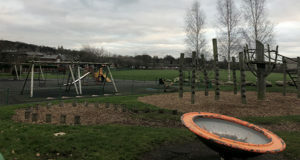 Knowsley’s budget was previously cut by £100m under central government austerity measures, and since the service of parks is not a statuary requirement, the council says funding must now be found by other means.